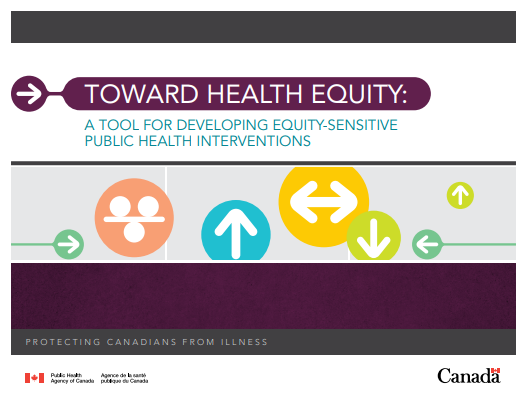 The Public Health Agency of Canada (PHAC) has developed this practice tool for public health professionals to support them in developing equity-sensitive public health interventions . The tool outlines five evidence-based elements to consider in order to integrate health equity into new and existing public health interventions . The tool describes the five equity elements and the relevant considerations related to each one and prompts the user to consider which equity elements are relevant to their intervention and identify ways to address them . Equity objectives: Is the intervention based on structure, environment, behaviour or health-care/service. Social determinants: What is/are the entry point(s) to intervention across the spectrum from socioeconomic and political context to the individual level. Mediating factors: What are the health-enabling or -limiting conditions? Engagement strategies: How are those with a vested interest in the intervention being involved? Equity targeting: How is the intervention targeted to improve health equity outcomes? Key operational definitions are provided, as well as a visual summary of the evidence related to the development of equity-sensitive public health interventions. consider the equity elements of interventions and how they might be addressed.